Over 1000 Practice Questions for Abstract Visual, Numerical, Verbal, Physical, Spatial and Systems Tests. This is the largest and most comprehensive book of its kind with over 1000 varied practice aptitude questions with accompanying answers and explanations. 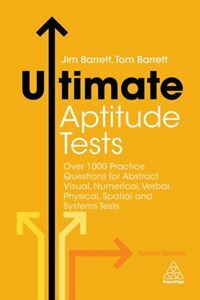 Businesses use aptitude tests when recruiting; sometimes even to fast-track potential leaders. Providing essential practice this title includes tests such as abstract visual tests, verbal and numerical reasoning tests, practical skills and understanding tests, spatial and systems potential tests and logic and intuition tests of different types. This new edition also now includes a brand new section on online testing environments as well as free access to a separate full online test to evaluate abilities.